Wash the blackberries and place them in a medium sized ceramic dish. Sprinkle over the sugar. If your berries are sweet, you can use less sugar of course, just add enough for your taste. Make the crumble: rub the butter into the flour then mix in the sugar. 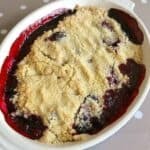 Add the rose water to the blackberries in the dish, then sprinkle over the crumble topping. Bake at 180 degrees for approx. 45 minutes, or until golden. We ate this on its own but it would go really well with ice cream, cream or custard.